Few things make you feel as cozy and at home as coming in from the cold to find a steaming mug of hot chocolate, already prepared, waiting to warm you from the inside out. Or, perhaps you prefer a spiced holiday drink, or a sip with a peppermint kick. Hot beverages are a wonderful way to weather the wintertime and experience the traditional aromas and flavors of the holiday season. You could prepare your favorite holiday drink on your cooktop, but a slow cooker offers some unique advantages. You can prepare beverages (or cold-weather staples like stews and soups) in your slow cooker so they’re ready for you when you return. Slow cooking comes with the added bonus of being greeted by the drink’s sweet or spicy scents as you walk in the door. Slow cookers also give flavors extra time to permeate throughout what’s cooking, which is essential for holiday drinks that rely on spices. Slow cookers are designed to do their job with minimal supervision, meaning they can be left unattended for extended periods while they cook what’s inside. If you’re entertaining, your slow cooker frees you up to enjoy your time with friends. 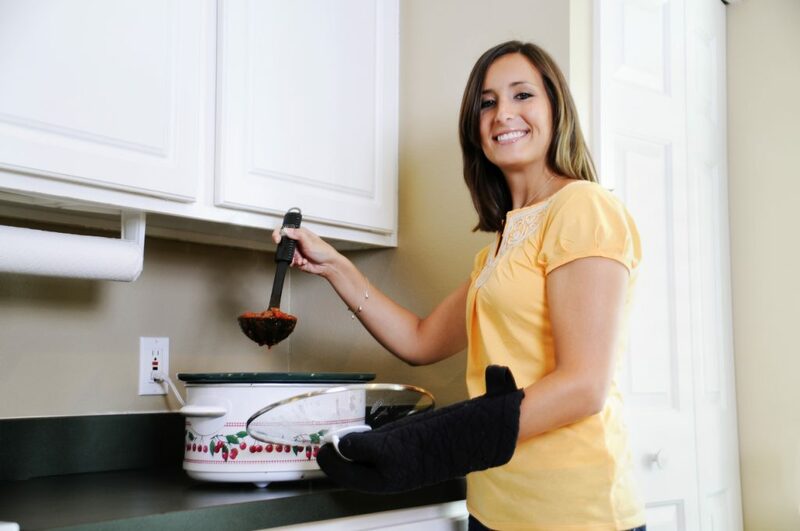 Set your slow cooker up in a common area with a ladle so guests can serve themselves. How a slow cooker works: Before we get to the holiday recipes, let’s run down how your slow cooker warms and cooks those wintertime favorites. The basic slow-cooker design includes an external shell, which usually houses the heating element, a pot for the food (often made from coated ceramic), and a lid. Slow cooker elements are low wattage because they are designed to cook slowly and evenly. Most have straightforward “low” and “high” settings, but the temperatures those heat to could vary depending on the brand. Check the slow cooker’s use and care manual for the temperature ranges. Some of the newer slow cooker models have incorporated connected features to increase the level of convenience. Some slow cookers can now be operated remotely, so you can start a meal or beverage cooking when it suits your schedule or change the setting when necessary. Hot buttered rum: Combine the tropical taste of rum with the wintertime flavors of holiday spices like cinnamon, nutmeg and cloves. And get ready to bring out the slow cooker again for Hot Buttered Rum Day on January 17. You will no doubt be tempted to lift the lid for an early inhalation of holiday ingredients, but lifting the lid early can lead to heat loss and slow down the process. What is your favorite warm holiday beverage?